Silver Proof Sets from the United States Mint are among some of the most popular products we have available. We are pleased to be able to offer some of the highest quality examples of U.S. Mint Silver Proof Sets at the Lowest Prices Online! Each set is hand selected to insure that there are no spots or toning on any of the proof coins. All U.S. Mint documents, including the certificate of authenticity and boxes are included. The 1959 Silver Proof Set contains the Silver Franklin Half Dollar, Washington Quarter and Roosevelt Dime, along with the Jefferson Nickel and Lincoln Cent in the U.S. Mint issued envelope. 1959 Silver Proof Set "Unopened Original Envelope"
The 1959 Silver Proof Set contains the Silver Franklin Half Dollar, Washington Quarter and Roosevelt Dime, along with the Jefferson Nickel and Lincoln Cent in the U.S. Mint unopened original envelope. The 1960 Silver Proof Set contains the Silver Franklin Half Dollar, Washington Quarter and Roosevelt Dime, along with the Jefferson Nickel and Lincoln Cent in the U.S. Mint issued envelope. The 1961 Silver Proof Set contains the Silver Franklin Half Dollar, Washington Quarter and Roosevelt Dime, along with the Jefferson Nickel and Lincoln Cent in the U.S. Mint issued envelope. 1961 Silver Proof Set "Unopened Original Envelope"
The 1961 Silver Proof Set contains the Silver Franklin Half Dollar, Washington Quarter and Roosevelt Dime, along with the Jefferson Nickel and Lincoln Cent in the Unopened Original U.S. Mint issued envelope. 1962 Silver Proof Set "Unopened Original Envelope"
The 1962 Silver Proof Set contains the Silver Franklin Half Dollar, Washington Quarter and Roosevelt Dime, along with the Jefferson Nickel and Lincoln Cent. This set is unopened in the original U.S. Mint envelope. The 1963 Silver Proof Set contains the Silver Franklin Half Dollar, Washington Quarter and Roosevelt Dime, along with the Jefferson Nickel and Lincoln Cent in the U.S. Mint issued envelope. 1963 Silver Proof Set "Unopened Original Envelope"
The 1963 Silver Proof Set contains the Silver Franklin Half Dollar, Washington Quarter and Roosevelt Dime, along with the Jefferson Nickel and Lincoln Cent. This set is unopened in the original U.S. Mint envelope. The 1964 Silver Proof Set contains the Silver Kennedy Half Dollar, Washington Quarter and Roosevelt Dime, along with the Jefferson Nickel and Lincoln Cent in the U.S. Mint issued envelope. 1964 Silver Proof Set "Unopened Original Envelope"
The 1964 Silver Proof Set contains the Silver Kennedy Half Dollar, Washington Quarter and Roosevelt Dime, along with the Jefferson Nickel and Lincoln Cent in the Unopened Original Envelope. 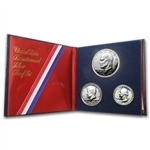 Each 1976 Bi-Centennial Silver Proof Set comes complete with the Silver Eisenhower Dollar, Silver Kennedy Half Dollar and the Silver Washington Quarter housed in the U.S. Mint casing. Each 1992 - 1998 Silver Proof Set comes complete with certificate of authenticity and box, as issued by the mint. Each set contains .61487 troy ounces of silver. Each 1992 Silver Proof Set comes complete with certificate of authenticity and box, as issued by the mint. Each set contains .61487 troy ounces of silver. Each 1993 Silver Proof Set comes complete with certificate of authenticity and box, as issued by the mint. Each set contains .61487 troy ounces of silver. Each 1994 Silver Proof Set comes complete with certificate of authenticity and box, as issued by the mint. Each set contains .61487 troy ounces of silver. Each 1995 Silver Proof Set comes complete with certificate of authenticity and box, as issued by the mint. Each set contains .61487 troy ounces of silver. Each 1996 Silver Proof Set comes complete with certificate of authenticity and box, as issued by the mint. Each set contains .61487 troy ounces of silver. Each 1997 Silver Proof Set comes complete with certificate of authenticity and box, as issued by the mint. Each set contains .61487 troy ounces of silver. Each 1998 Silver Proof Set comes complete with certificate of authenticity and box, as issued by the mint. Each set contains .61487 troy ounces of silver. All Ten U.S. Mint 1999-2008 Silver Proof Sets at an amazing price! Each set comes complete with certificate of authenticity and box. High grade ultra cameo coins with no toning on any of the coins. The 1999 Silver Proof Sets is one of the most sought after sets. Contains the (5) Silver Quarters, Silver Half Dollar and Dime as well as the Nickel and Cent. These 2000 Silver Proof Sets contain the first minted Sacagawea Golden Dollar Proof coin. A terrific value at this price. The 2001 Silver Proof Set contains ten stunning, mirror like proof coins. Comes complete with box and certificate of authenticity with no toning on any of these high grade ultra cameo coins. The 2002 Silver Proof Set is a fantastic bargain at these prices. Each set comes complete with box and the certificate of authenticity, with no toning on any of the high grade ultra cameo coins. The 2003 Silver Proof Set is another steal at these prices. These sets come complete with box and certificate of authenticity, and no toning on any of these high grade ultra cameo coins. The 2004 Silver Proof Set, a tremendous value at these pricing levels. Comes complete with the box and certificate of authenticity as well as no toning on any of these high grade ultra cameo coins. These 2004 Silver State Quarter Proof Sets feature the Michigan, Florida, Texas, Iowa and Wisconsin 90% Silver State Quarters. The 2005 Silver Proof Set also contains the popular "Westward Journey" Nickels, as well as the other issues for the year. Another great value on these high grade ultra cameo coins with no toning. These 2005 Silver State Quarter Proof Sets feature the California, Minnesota, Kansas, Oregon and West Virginia 90% Silver State Quarters. The 2006 Silver Proof Set, another great value at these prices. These sets come complete with the box and certificate of authenticity as well as no toning on any of these high grade ultra cameo coins. These 2006 Silver State Quarter Proof Sets feature the Nevada, Nebraska, Colorado, North Dakota and South Dakota 90% Silver State Quarters. The 2007 Silver Proof Set at a great price. These sets come complete with the box and certificate of authenticity as well as no toning on any of these high grade ultra cameo coins. These 2007 Silver Proof State Quarter sets feature the Montana, Idaho, Washington, Wyoming and Utah 90% Silver State Quarters. The 2008 Silver Proof Set at an incredible price! These sets come complete with the box and certificate of authenticity as well as no toning on any of these high grade ultra cameo coins. These 2008 Silver Proof State Quarter sets feature the Oklahoma, New Mexico, Arizona, Alaska and Hawaii 90% Silver State Quarters. The 2009 Silver Proof Set. Let's just say stunning. Eighteen coins in all, including the Lincoln Bi-Centennial coins, and the six Silver Territory Quarters. The 2009 Territories Quarter Silver Proof Set contains the D.C., Puerto Rico, Guam, American Samoa, Virgin Islands and Northern Mariana Islands Proof coins. The 2010 America the Beautiful Silver Proof Set contains the Hot Springs, Yellowstone, Yosemite, Grand Canyon and Mt. Hood 90% silver gem proof coins. The 2010 Silver Proof Set is a steal at these prices! These sets come complete with the box and certificate of authenticity as well as no toning on any of the coins. The 2011 America the Beautiful Silver Proof Set contains the Gettysburg, Glacier, Olympic, Vicksburg and Chickasaw gem 90% silver proof coins. The 2011 Silver Proof Set comes with the redesigned outer box. Like the 2010 sets, these have a similar low mintage of just 574,175. The 2012 America the Beautiful Silver Proof Set contains the El Yunque, Chaco Canyon, Acadia, Hawaii Volcanoes and Denali gem 90% silver proof coins. The 2012 Silver Proof Set is destined to become one of the all time classic sets with a mintage of just 395,443. Pick one of these rare sets now while the prices are low. These sets feature the White Mountain, Perry's Victory, Great Basin, Fort McHenry and Mount Rushmore 90% Silver Park Quarters. The 2013 Silver Proof Set. What a value! Only 419,720 sets were minted. Includes the Park Quarters, Presidential Dollars and the cent, nickel, dime, half and dollar coins. The 2014 Silver Proof Set had a mintage of just 429,364 units. These beautiful coins have deep cameo fields and are as good as it gets. These sets feature the Homestead, Kisatchie, Blue Ridge Parkway, Bombay Hook and Saratoga 90% Silver Park Quarters. The 2015 Silver Proof Set is the latest work of art by the U.S. Mint. These beautiful coins have deep cameo fields and are as good as it gets. These sets feature the Shawnee, Cumberland Gap, Harper's Ferry, Theodore Roosevelt and Ft. Moultrie 90% Silver Park Quarters. The 2016 Silver Proof Set is the latest work of art by the U.S. Mint. These beautiful coins have deep cameo fields and are as good as it gets. These sets feature the Effigy Mounds, Frederick Douglass, Ozark Rverways, Ellis Islands and George Rogers Clark 90% Silver Park Quarters. The 2017 Silver Proof Set is the latest work of art by the U.S. Mint. These beautiful coins have deep cameo fields and are as good as it gets. These sets feature the Pictured Rocks, Apostle Islands, Voyageurs, Cumberland Island and Block Island 90% Silver Park Quarters. The 2018 Silver Proof Set is the latest work of art by the U.S. Mint. These beautiful coins have deep cameo fields and are exceptional. The 2018 Silver Reverse Proof Set is the first set that has had all the coins in reverse proof condition. A set that must be seen to appreciate. These sets feature the Lowell, Memorial Park, War in the Pacific, San Antonio Missions and Frank Church 90% Silver Park Quarters. SILVER PROOF SETS are U.S. Mint collectible sets which contain the circulating coinage issued for the year in gem proof condition. The proof coins in the Silver Proof Sets all have a highly polished collector finish which gives them a mirror like surface. In addition, the Half Dollar, Quarters and Dimes are made of 90% silver making them more desirable to coin collectors. Add some of these low mintage sets to your coin collection here.